The apartment is situated right by the 'Bollin' piste, close to the funicular entrance, on the first floor of the Tommeuses apartment building in stylish Val Claret, the highest village of Tignes. It has a south-facing balcony, with wonderful views of the Grande Motte; the mountain famous for its glacier skiing. The apartment comprises of a lounge with a dining area, TV and DVD player, small stereo system and a modern double sofa bed; bedroom with 2 single beds and a mezzanine double bed; bathroom with shower over bath; fully equipped kitchen with oven, dishwasher, microwave, electric kettle & toaster; and separate WC. The apartment has the benefit of a wooden floor in the entrance hall and fitted carpets in the bedroom and lounge. There is a separate secure ski locker room on the ground floor, which has key-pad security access, leading straight onto the piste. This comfortable apartment offers the convenience of doorstep skiing at its best! Winter:: The apartment provides sleeping accommodation for up to 6 adults in two rooms. There are 2 single beds and a double mezzanine bed in the bedroom and 1 double and 2 single sofabeds in the living room. Single, double and king size duvets, pillows and blankets are provided but clients will have to bring their own bedlinen and towels. There is a well-equipped kitchen, bathroom with over bath shower and a separate toilet. The skiing in limitless - linked with neighbouring Val d'Isere, there are more than enough lifts and runs to suit all tastes and abilities. The resort has been upgraded and improved over the past 20 years and has every amenity available, including 30 restaurants in Val Claret alone. The apartment location is particularly convenient for families with young children - being so close to ski schools, and skiing to and from the back door. Snowboarders are very well catered for in Tignes with a special snowboard park in Val Claret at the top of the Tichot lift on the Col du Palet. Summer:: Tignes is a superb summer holiday resort at the edge of the Vanoise National Park. In addition to the wealth of summer sporting activities, skiing is possible most of the year on the Grande Motte glacier. Thirteen lifts are open with 50km of pistes, descending 1000 metres. Numerous courses are on offer for skiers and snowboarders throughout the summer season (July and August). Tignes also has a superb 18 hole golf course, the highest course in Europe, as well as 50 tennis courts, squash courts, fishing, mountain climbing, walking, horse riding, mountain biking, white water rafting and many other activities on offer in the summer. Many of these activities are included on the summer lift pass. Tignes boasts a spectacular water sports centre in Tignes Le Lac (Le Lagon) . This indoor facility opened in July 2006 and houses a fabulous swimming and watersports centre on the edge of the lake in Tignes Le Lac. During the summer season of July and August Tignes really comes alive with a huge range of activities. Mounain biking has really taken off as the premier activity with mountain bike trails of all grades of difficulty linking up with Val d'Isere. You can take your bike up on the specially adapted ski lifts for free and ride down at your leisure on the green, blue, red and black trails. Mark and I met skiing in 1981 and have been skiing together ever since! Val d'Isere and Tignes have always been our favourite skiing area and we always came back, particularly at Easter. We now travel to our apartment at least 3 times a year from our home in Chichester in West Sussex. No. 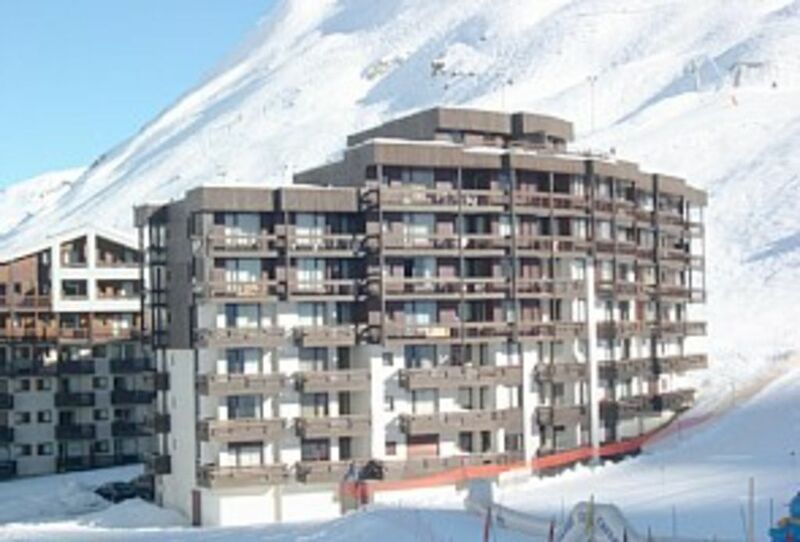 4 Les Tommeuses became available in 1988 and was the first property we viewed in Tignes. We had seen the apartment building being built in 1985 as we went up the Bollin chairlift and I always wanted to have an aparment there. We fell in love with it and the rest is history! The view from the balcony is second to none as well as the proximity to the slopes and the ski in - ski out nature of the apartment. The Gardien (Florence) is fantastic and will help you with any problems. We have tried to make the aparment as comfortable as possible and keep it well stocked with all the necessary kitchen utensils etc. to make your holiday as pleasurable as possible. The apartment is close to over 30 restaurants and bars yet on the edge of the slopes and very very quiet. The apartment is so close to everything you need and in the summer the views from the balcony are just as breathtaking. We love watching the traditional alpine dairy farming with the gentle sound of cow bells ringing in the air. Mountain biking has really taken off in Tignes/Val d'Isere in the summer and the apartment is perfect for an activity summer holiday. There are trails of all difficulty across the whole of the Espace Killy area. There is a small compact bathroom with an over bath shower. The toilet is separate. Electric heaters in each room. Unlimited hot water all the time. Very well equipped - full range of pans, sauté pan, caftiere, hob style expresso maker, toaster, Pyrex dishes, glasses, mugs, pepper mill. French TNT sat is available providing multiple channels in many languages. Some programmes can be watched in their original language even if they have been dubbed into French. iPod docking station on the stereo. The balcony has a small round patio table and 4 patio chairs which is ideal for sitting in the sun eating lunch or having a beer after skiing, particularly in the later season. There are fabulous views from the balcony over the ski area looking up to the Grande Motte glacier. The apartment building has been refurbished to a high standard. This included a secure ski locker room on the ground floor, new entrance foyer and decoration and refurbishment of the communal landings on each floor. The ski-locker is substatial and will hold up to six pairs of ski boots and skis/snowboards. The apartment has been completely re-floored with wooden flooring in the entrance hallway and fitted carpet in the bedroom and lounge. A TV with French TNT sat has recently been added to the lounge area where you can watch many channels in a multitude of languages. There is also a DVD player. Can't get better than this for easy access to pistes and village facilities. Everything is on the doorstep. Good communications and helpful tips from the owners. Well equiped apartment with comfortable beds. Comfortable for 4, but will sleep more. Suitable for families and quiet at night. Plenty of shops, bars and restaurants within a few minutes walk, and useful free bus service to other parts of Tignes. No need for a car while you are there. Free access to the local leisure pool and ice-skating rink with a weekly ski pass. Big price differences between restaurants, not always reflected in quality. It is worth looking around and trying some of the smaller, cheaper places. Good quiet skiing areas over the ridge using the "Fresse" lift in front of the apartment, but return runs to Val Claret are either relatively hard blues ("Isolee", "Piste H"), or involve up-hill sections. Beginners area right outside the apartment, but gets busy. This area is probably best for people who are at least at the stage where they are comfortable with tougher blue runs and can tackle some reds. On a good day, the treck over to the pistes above the Col de l'Iseran, via Val d'Isere, is well worth the effort. Tignes is situated in the 'Espace Killy' ski region, known as the greatest ski area in the world. With its neighbouring resort of Val d'Isere, it offers unrivalled skiing for all standard of skiers, including children. The resort itself has undergone a complete transformation over the past few years and now offers all the modern conveniences that skiers expect, both during the day and at night. There is no other modern european resort to rival Tignes, its accessibility, its location and its convenience. Once you have been - nowhere else compares! Ski: The ski resort continues to go from strength to strength. There has been an extensive lift replacement programme with almost all of the lifts in the Espace Killy ski area replaced by high speed geared express lifts - making the lift queue a thing of the past. Tignes is the only resort that I know of that no matter how many skiers are on the slopes at any one time, there is never a lift queue. This is one resort that has got it right!! Why put up with queueing? Come to Tignes and ski!! Summer: During the months of July and August, Tignes comes alive - not only with summer skiing on the Grande Motte glacier, but with the sound of mountain bikes. Graded bike trails have been created all over the Espace Killy and the link with Val d'Isere was opened in the summer of 2012. Key ski lifts have been fitted with bike carriers to take riders up the mountain and are currently FREE!! For the non bike enthusiast, there is sailing on the lake, horse riding, walking trails around the Vanoise National Park, watersports, white water rafting at Bourg St Maurice, and lots of other sporting activities - or just sit around the lake sunbathing!